What Makes For A Good Explanation? An explanation makes facts understandable to an audience. However, an explanation isn’t just a list of facts. Without context, facts can be difficult to comprehend and remember. All good explanations have one common result: they make the audience feel smarter. There are three steps to creating a good explanation: planning, crafting the message, and verification. We determine what we want to communicate, we create our message, and then we verify the message is received and understood. Planning involves identifying the audience. It is our audience who decide if an explanation is clear. A lot of business and particularly academic communication can be dense, wordy and impenetrable. If you, as the audience, don’t understand the speaker’s message, then who is at fault? In many cases, it’s the speaker. They might make themselves appear clever, and feel good about themselves, but if we don’t understand their explanations, then they have failed to communicate. The aim should be to make the audience, not ourselves, feel smarter. Put yourself in their shoes. What questions will they likely have? If they asked “why” about every single point you make, does your explanation include the answers? Consider their environment in which your message will be received. Are your audience industry people at a conference, bound to their chairs for the duration? Is your audience clicking through links and pages on the web hunting for something specific? The environment affects how the explanation is crafted and delivered. The environment likely imposes certain constraints that also affects the message. Your talk might be limited to twenty minutes, or your document limited to so many words. Constraints can lead to more memorable stories by forcing the writer to focus. If he’d had more time, perhaps he would have gone into a lot more detail. But would it have been as punchy? Audiences always vary in terms of existing knowledge. Unless you’re talking one-on-one, there will be some experts who have heard it all before, some people who are new to it all, and the rest falling on a continuum somewhere in between. It can be difficult to please everyone in such circumstances, so be clear what you goal is – keep the end in mind, and work backwards – then identify the most significant audience i.e. the people who must understand your message in order for you to fulfill your goal. If your goal is to enlighten newcomers about the benefits of SEO, then you would craft your explanation to appeal to them, and spend less time talking to the advanced people. If you need to talk to both groups, then you’ll obviously need to bring the beginners up to speed first. Those with advanced knowledge don’t tend to mind you going over old ground, so long as you signal that is what you are doing, and there will be a payoff for them later. Start at the end. What is the one thing you want people to do after they hear or read your communication? Known as the “Five Ws”, this is a good strategy for your topic research phase, as it helps us get the “full story”. Each question should have a factual answer. Focus on “why”. Start with the “why”. Once people understand why you’re doing something, they’ll more readily listen to the rest. No doubt you remember the phrase “if it doesn’t fit, you must acquit”. In “How To Deliver A TED Talk”, Jeremy Donovan talks about what makes for a great catchphrase. They are rhythmic. They often have internal rhyme (“fit/acquit”). “When you construct a two part catchphrase, make the second part positive and sharply contrasting with the first part…”You must acquit if the glove doesn’t fit” simply does not have the same ompf”. Plain language (also called Plain English) is, as the name suggests, is about using simple words and phrases. In short, don’t use ten words when one will do! President Obama signed Plain Writing into law in 2010, in the form of the Plain Writing Act . The aim was to improve the effectiveness of communication between Federal agencies and the public. This is the polar opposite of the type of writing many Universities teach. It took me years to get out of the painful habit of using the convoluted dense, academic writing that I’d learned at University. Whilst academic writing has it’s place, this mode tends to be too wordy, time consuming and confusing outside the world of academia. This is not a slight on the audience’s intelligence. Academic writing simply isn’t a style that is geared to modern day life for most people. Your audience aren’t stupid, but they are likely to be time constrained and so must divide their attention between a multitude of competing messages. This is easier to do if your message is readily understandable. The phrase “don’t make me think” applies to both usability and language. Use active voice, rather than passive voice. Active voice is where the subject performs the action denoted by the verb. For example, “the fox jumped over the lazy dog”, not “the lazy dog was jumped over by the fox”. Use personal pronouns: I, we and you. Be clear and concise. Sentences and paragraphs are often improved by severe trimming! Avoid slang and cliche. It can be ambiguous. Write short sentences. Present one idea per sentence. Use titles and subtitles that are informative or summarize the text. Many of the most successful applications on the internet were related to something people already did, and that they knew well. Email is like writing and sending a letter. A search engine is like using a library catalog. Facebook is like a yearbook. YouTube is like a home video player on your computer. “Yes, search is magical. For years, I’ve described search as a “reverse broadcast system.” In a broadcast system, advertisers spend lots of money to reach a mass audience, hoping to build desire for a product or service. But most of the audience is not interested in their pitches. Search is the reverse. Each search is an expressed desire, something that someone at a particular time actually wants. Advertisers can tune in to the “desire-cast” that’s going on”. A common sales technique is to get the prospect to answer “yes” to questions. The interaction feels more positive, and the prospect is more likely to want to answer yes to further questions, which may involve a sale. By stating a fact on which everyone can agree – such as “it’s difficult for lay people to understand what an SEO does” – you build empathy. People will feel what you’re saying is relevant to them. You can then ease them into the change you want them to accept. There’s an old joke about Microsoft. A balloon was flying high above Seattle, but the pilot was lost. The pilot slowly drifted over a building, drew a handwritten sign, and held it up. The pilot’s sign read “WHERE AM I?” in large letters. People in the building quickly responded to the pilot, drew a large sign and held it in a building window. Their sign read: “YOU ARE IN A BALLOON!” The pilot smiled, waved, looked at his map, determined the course to steer to his destination, and landed safely. After the pilot landed, the passenger asked the pilot how the sign helped determine their position. The pilot responded “I knew that had to be the Microsoft building because the response they gave me was technically correct, but completely useless. Context is the circumstances that form the setting for an event, statement, or idea, and in terms of which it can be fully understood and assessed. Try starting with a high level view. The 50,000 foot view. I often find it’s a great way to set the context for an explanation by explicitly stating “So, here’s the 50,000ft view….”. People then expect to hear the broad context. Then drill down to specifics. For example, if we’re talking about SEO, the 50,000 foot view might be “how do we make sure the relevant audience hears your message?”. SEO is a subset of that idea, but readily understood within that broad context. Carol has a presentation to make tomorrow, but she hasn’t yet started. She stares at the blinking cursor. She just can’t think of a good way to start! Carol emails her friend, Dave, and asks for a few tips. Dave suggested that Carol just start writing in a stream of consciousness, even if what she was writing seemed like gibberish. He told Carol this would help her separate the writing side of her brain from the editing side. Her internal editor was restricting her. Carol tried the technique, and found she filled up five pages quickly. She went back and edited what she had written down to two pages of useful material. If you’re ever stuck staring at a blank page, give the stream of consciousness approach a try. A basic story, but it works because it’s easily understood. Stories help make facts more memorable. Character has a problem. Character feels pain. Character discovers a solution to her pain and tries it out. As a result of trying the solution, character overcomes pain. Another way to use stories is to contrast how people do things now, with how they could be done better. For example, if the customer is using print, radio or tv advertising, then the pain might be the difficulty in tracking response. How do they know which advertising is most effective? A cure for the pain might be to use internet advertising, where they can track actual visitor response and link this data back to their marketing campaign. Speakers often ask people to raise their hands if they know about certain things. This helps them gauge where to pitch. It also helps them get to know their audience better. Seeking feedback helps ensure your message understood and remembered. There’s nothing much to say about verification other than to make sure you roll feedback it into your strategy. Ask questions, test your messages out on friends, enable comments, directly ask people what they think. It’s the only true way to know if your explanation worked. 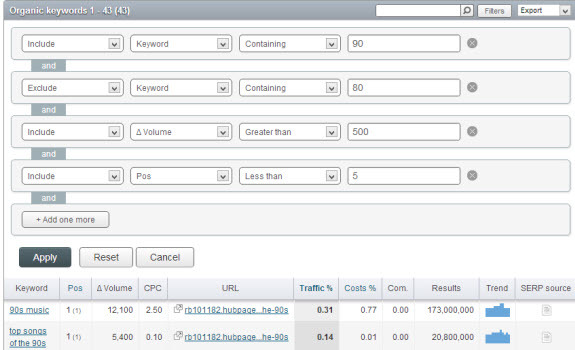 Ahrefs is going to close Keywords Analysis on 11 January 2013. Till that time Keywords Analysis will be totally free for all. So if you wanted to use a competitive research tool for free, set up a free account with Ahrefs today, look up your leading competitors to see their top keywords & if there are any areas that they are targeting that you missed. A number of other competitive research tools & rank trackers have also offered free trials & discounts in order to try to get people to give them a try. SpyFu is offering a free 3-month trial. A couple great features from SpyFu are cached historical SERP results & the ability to download an unlimited number of keywords per website (many competing services only allow you to download the top 1,000 or 10,000 or so keywords per listing). 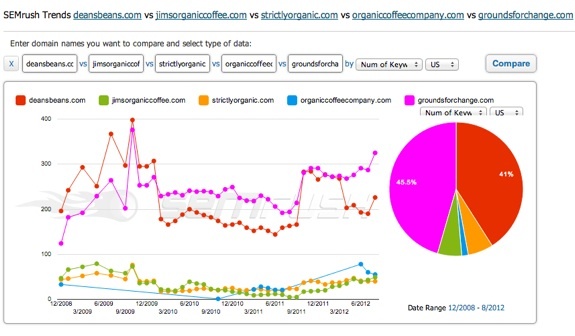 Their free trial also includes their RECON files product, offering brandable reports. SEM Rush is offering a free 1-month trial. They have some innovative features in allowing you to cross compare sites, as well as comparing AdWords vs organic search data. Recently they added filters by URL footprint. Advanced Web Ranking is a desktop-based rank tracking tool. They offer a boatload of features & a free 30-day trial. You rarely see Google warning people against meta tags or blocking people from shooting themselves in the feet. That some of these companies are being warned out of the market is recognition of the value of the data by Google. That many of the remaining tools are offering free trials is a Christmas gift for SEOs. Content marketing is a catch-all phrase to describe the use of content to attract people, convey marketing messages, and lead people to take a desired action. One obvious example is a blog which provides content demonstrating our specialist knowledge in a given niche. We are sharing information, and we do so for free, however our underlying agenda is to engage people in order to sell our professional services or products, or our message. Conventional marketing approaches, which may involve publishing sales copy, as seen in brochures, or on landing pages, don’t tend to provide information of high value. This type of content is usually a description or depiction of a service or product, and little more. It is disposable. Content marketing is about creating and distributing genuinely valuable information, that remains valuable over time. It is less direct than conventional marketing, but can be considerably more effective, as many people are put off by low-value sales pitches. In a sea of information noise, valuable content stands out. It gives us more opportunity to engage customers. Content marketing can be cost effective. If we run a PPC campaign, we may budget $x per week, but we know that when the spend stops, so does the traffic. By contrast, if we spend the same amount producing and marketing a piece of content, we may receive ongoing visitors over time with little or no additional cost per visitor. The invention of the printing press changed the world. It enabled the mass production of books, which up until the 1400s had been the domain of scholars. Anyone with access to a printing press became a publisher, and could spread their information far and wide, so long as they had access to a distribution network. Publish. Distribute. Profit (or whatever your aim happens to be). The Internet was an even greater invention. Not only can we publish, but we can distribute to everyone else in the world, so long as they have an internet connection, at the touch of a button. The middle-man is being disintermediated. The third-party publisher is becoming increasingly obsolete. These people used to be the gatekeepers. The economics of distribution served as a barrier to production, even if you did have access to a printing press, or typewriter. As a result, there was a lot less published content in the past than there is today. It is now estimated that the internet consists of 5.7 terabytes of content, and it is growing rapidly every second. Given there is so much content being produced, and only so many humans with limited time to read it, it is clearly not enough to just publish and hope people will come. Instead, we must devise strategies to actively market content in order to fulfill our business objectives. Content is whatever you choose to create. In terms of content marketing, it is content an end user will find valuable. The content you create should be the content your chosen audience will most likely respond to, and engage with. Many people assume that they should create content first, then seek an audience. However, the most effective content marketing finds an audience first, and then works backwards to create content that meets audience demand. When devising your content marketing strategy, it’s a good idea to think of this process back to front. First, establish the market demand for the content, then create the content to supply that demand. 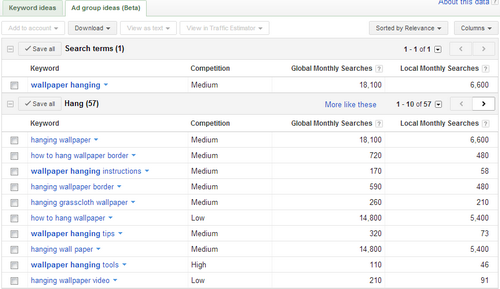 You can gauge demand by using keyword research. If you’re familiar with this topic, feel free to skip this section. 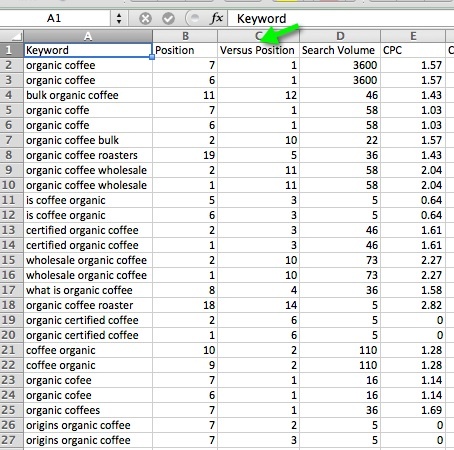 If keyword research is new to you, then you’re about to discover one of the most powerful techniques in marketing. We start by gauging existing demand. 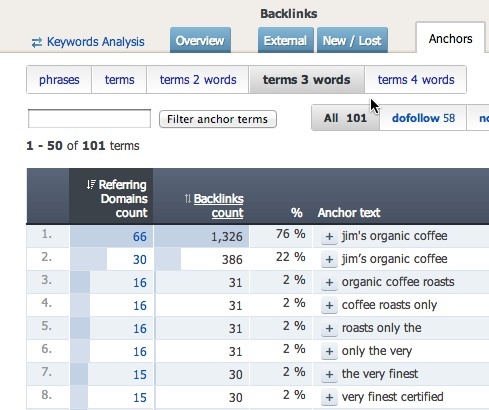 A great way to do this is to use a keyword research tool. 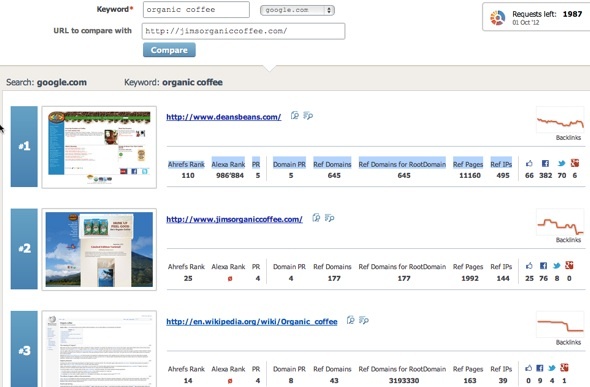 There are various keyword research tools, and they all operate in much the same way. They collect keyword search data i.e. the keywords people use to search on search engines and count how many times people use certain keyword phrases. The aim is find existing streams of keyword traffic that relate to your niche. 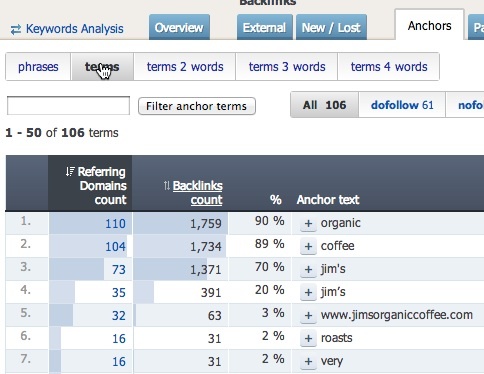 You then build content around these keyword terms, thus satisfying demand you already know exists. 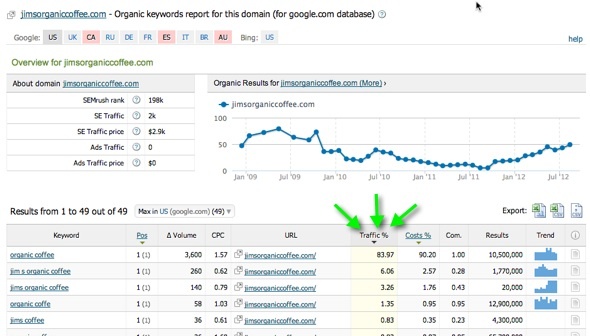 The first stage of keyword research doesn’t involve a keyword research tool. The first step is to clearly define your niche and potential customers. Imagine we’re running a wallpaper hanging business. This business has determined their customers are people who have already purchased wallpaper, or will soon do so from another supplier, but want to know how to either hang it themselves, or get someone to do it for them. This wallpaper hanging service makes money by selling people their hanging service, or by selling them tools to get the job done themselves. These tools include seam rollers, brushes, pasting tables and instructional e-books and DVDs. It’s important to be clear about what you offer, who your customers are, and what you want them to do. Once you have this clear in your mind, it makes it much easier to choose the right keywords. Also, you won’t waste time and money on keywords that won’t result in the action you desire. For example, there wouldn’t be as much value in targeting terms such as “designer wallpaper” as our example business does not sell wallpaper. Create an Adwords account, or if you don’t wish to create an account, provide the type in characters. In the “word or phrase box”, enter a keyword from your list. Google will show you your keyword term, plus related keyword terms, and give you an idea of how many times people have searched for each keyword term. As we can see from this result, there are a number of keyword terms that would provide a great basis for our wallpapering businesses content marketing strategy. 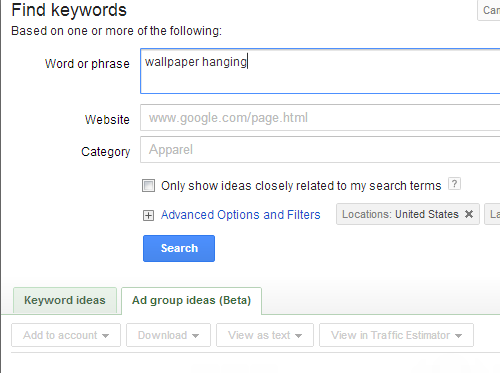 The keyword phrase “how to hang wallpaper” has around 14,800 searches per month, and gels nicely with our business case. “Wallpaper hanging instructions” only has 170 searches per month, but it might be a great term to target given this business sells ebooks providing instruction on how to hang wallpaper. Repeat this process for all your keyword terms, thus building up a list of possible, relevant terms. These keyword terms become headings and topics for your content production. You can, of course, use a variety of different keyword tools, which will give you slightly different information. However, don’t get too bogged down in the numbers. A rough idea of keyword volume is good enough, because you don’t yet know what content will work best in terms of achieving your business objectives. For example, a keyword may have a high search volume, but your competitors have also noticed this fact, and have provided a lot of information on this topic. This means it’s more difficult to rank well for that term. It’s also possible the keyword term doesn’t translate into business value. The only way to know for sure is to publish information and track results. It’s best to try and pick highly relevant terms that have existing demand but the content offered by your competitors is either non-existent, or of low-quality. Also keep in mind that by publishing content and monitoring results via your analytics, you’ll create a rich keyword data set of your very own. 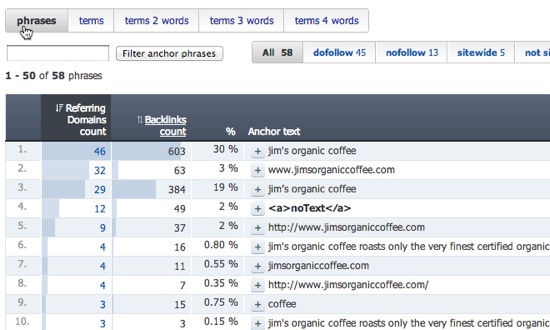 Your keyword logs will reveal the search terms under which visitors have found your content. These keyword terms will likely be variations on the keyword terms you targeted and may not show up in keyword research tools. This information is gold and difficult for your competitors to acquire. This data will give you more ideas for appropriate content in future, or ideas on how to tweak your existing content to better meet visitor needs. In this respect, we’re constantly iterating around what users actually want, as opposed to what we imagine they want. 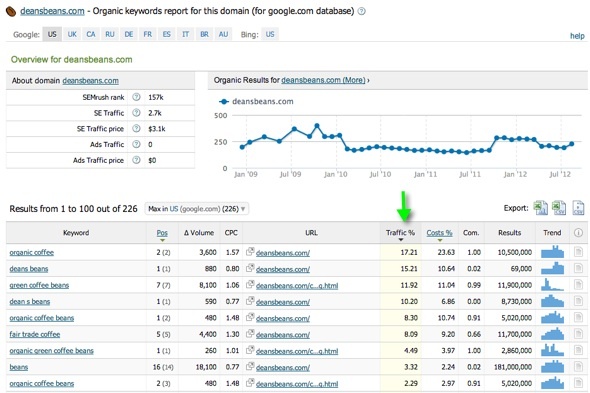 Other tools that can help you decide on what content to publish include trend spotting tools. Here’s a good list. One good way to use trend data in a content marketing strategy is to look for fast breaking trends and, if they are associated with your niche, publish content on the trend topic in order to capitalize on the growing interest. This approach is particularly suited to news-driven content. Let’s look at one trend tool in a bit more detail, as it’s free and therefore readily accessible. Google Trends, like the Google Keywords tool, shows how often a keyword term is searched for relative to the total search-volume across various regions of the world. This tool was split out into Google Insights For Search, but Insights has been shut down and reintegrated back into Google trends. 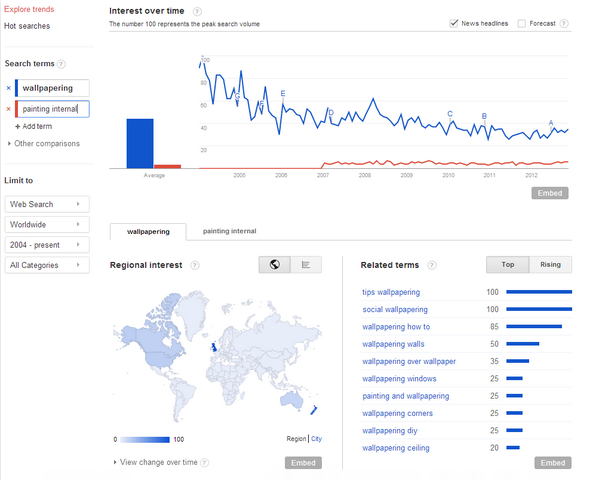 Google Trends is a great tool for comparing the relative popularity of one term against another. However, it’s most compelling use is to spot rising trends relating to your keyword area. Content that caters to a new, rapidly growing demand has a high chance of success because chances are there isn’t a lot of existing quality content on the topic yet. We can also see which regions are most interested in these trends. For example, wallpapering appears to highly popular in the UK. This might be a good regional target audience for our company. Another tip: look for “where do I” + keyword questions. For example, if you constantly monitor “where can I” + wallpaper in Twitter, you could respond to relevant tweets, in real time, and post your URL. It’s also a great way to gauge what is really on people’s minds. Our wallpapering company might assume people want wallpaper services and tools, yet they might spot a lot of questions about removing existing wallpaper that they hadn’t considered or emphasised. Also use variations, such as “how can I”, “anyone know”, etc. This type of research can help make our FAQs pages more relevant, too. After all, we have clearly documented evidence that the questions we answer really are frequently asked questions! The internet is a rich, multi-media environment. Use Google Keywords and search for categories of information relating to your niche i.e. wallpapering + video, wallpapering + photos, wallpapering + white papers. This way, you can gauge demand for each type of content before you create it. Video – creating video is getting easier and easier as cameras and editing software becomes ubiquitous. Video is particularly good for demonstrating procedures or for anything that is action oriented. Pay careful attention to lighting and sound as these areas can make a video appear cheap if done poorly. Infographics – an info-graphic is a graphical representation of information. The London Tube map is a famous example of an info-graphic Today, marketers use info-graphics to draw attention by visualizing data. Articles – How-to articles, advice, promotion, descriptions, stories, and anecdotes. White papers – authoritative report or guide that helps readers understand an issue. Typically, white papers make an argument as to why one product or service is the best option to solve a business problem. They can take the form of a backgrounder, a set of tops, or pose a problem and a solution. Case studies – case studies are research, bringing together data and analysis, and making observations about the results. An example of a case study could be how you approached and solved a problem for a client. These are especially useful when the results can be applied universally. News – the latest news, gossip, or insider industry information. Blogs – a less formal take on news, typically heavy on opinion and discussion. Also consider forums. Tweets – you can use Tweets to get known for covering a particular niche of information. For those new to Twitter….. The main advantage of content marketing is that it is enduring. Unlike a PPC campaign, which stops when you stop paying, content can endure for many years. The cost of hosting content is almost zero, so there is little reason to delete it once created. “Evergreen content” – which means content that will always be relevant – can draw visitors many years after publication. For example, the activity “hanging wallpaper” doesn’t really change much, so if you wrote a definitive article and made a video on how to hang wallpaper, it will stay relevant over time. Contrast this with news, which has a short shelf life i.e. is useful only so long as it is new, before it’s replaced by more recent news. Your content should also be engaging. The internet is changing rapidly from a top-down publishing medium to a relationship medium. You could just publish, and the reader could passively consume your content, however content can be made a lot more engaging if the reader can interact with it. Given the opportunity, they may comment on it. They may share it with their friends via social networks. They may write about it on their blogs. They may repurpose it and make something else out of it, and redistribute it again. This activity can make your content more usable and extend your reach. Viral marketing is based on this idea i.e. where one person takes a message and then spreads it, and then ten more people spread it, and so on. Think about ways to make this happen. How can you encourage people to share your content with others? For a content strategy to work, you need to establish authority. Are you the go-to person in your niche? Are you one of the few go-to people in your niche? If not, then it’s going to be difficult to establish authority. Lack of authority will undermine a content marketing strategy as it’s only human to question if someone is worth listening to before we give our time to them. There are many ways to establish authority. The hard way is to spend a lot of time challenging established competitors. An easier way is to go where there aren’t many – or any – competitors. One way to do this is to redefine your niche. Go more granular until you find some clear space. Here’s a great example of this in action. Craig focuses on a narrow niche – the quality score in Google Adwords. This is not to say Craig is not an authority in other areas, he may well be, but his detailed content and razor sharp focus certainly help establish him as the authority on the quality score. By doing so, he’s not competing directly with every other PPC expert. He’s created his own clear space. If you want to compete with established authorities, then one good tactic is to associate yourself with thought leaders in that niche. You could guest post on their blogs, interview them, get links from them, be seen with them, and so on. Sometimes, we can even get away with not being an authority, but be considered one, simply by association. If you have a guest post published on no-nameblog.blogspot.com is not going to carry as much weight as having the exact same article published in the New York Times. Look to leverage the existing reputation of publishers. Once you’ve decided on your niche, you should then demonstrate mastery. This helps establish trust, which leads to engagement. You will likely receive more links (nobody provides legitimate links to non-authorities, unless paid to do so) and have more people contact you than if you provide mediocre content. It’s almost impossible to provide too much detailed information. In our wallpaper hanging company example, they might create a half hour video on wallpaper hanging, backed by ten articles outlining each step in detail. They show the tricks of the trade, the problem areas, and how to achieve the best finish. Now, some people will consume this information and undertake the wallpapering job themselves. However, most people will see it as a demonstration of mastery, which builds trust, meaning they are more likely to call this company. The company has demonstrated they can do the thing they are selling – wallpaper hanging. This wouldn’t be nearly as effective if they just wrote a few hundred words of copy saying how great they are at wallpaper hanging. The same goes for cooking shows. Most people who watch cooking shows don’t cook the recipes being demonstrated. Why not? Because people have other constraints. They may lack the time. They may have other things they need to do that have a higher priority. In the end, they watch the show, then go to a restaurant i.e they let the professionals do it. Yes, you’ll always have those who do-it-themselves, but they were never really your customer anyway. If you didn’t offer this content, they’d just find it from somewhere else. However, our wallpaper company can still sell these people wallpaper hanging tools! After all, they’ve just shown them a video demonstrating how to use them. This is business value being built on top of providing valuable information for “free”. If you become the trusted authority in your niche, you are creating a strong brand by default. The value of brands lies not in the logo or symbols, but what those logos and symbols represent. The Apple brand is not just an Apple logo, or a look, it’s about the experience of buying, owning and using an Apple product. While no company is perfect, Apple don’t do half the job well, and then let the quality drop for the other half. Brands typically need to be consistent in order to be valuable. Likewise, a content strategy should be based on delivering consistent quality. This is a change in approach that was common on the internet a few years ago. 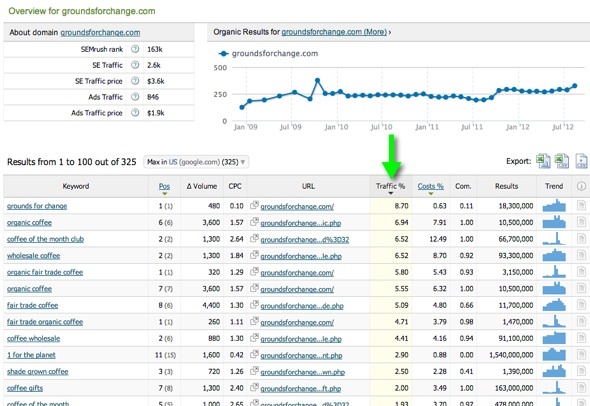 Before the Panda/Penguin updates, Google rewarded content, so people produced a lot of content. The more content you had, the more visitors you could likely attract. This was the basis of the content farm strategy and it resulted in a lot of poor quality content. However, the emphasis is shifting towards quality and this trend will continue. 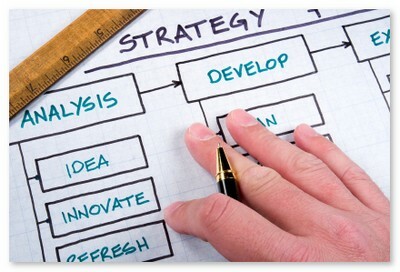 Therefore, a sound content marketing strategy should be based on producing high quality, valuable content. Although the rhetoric doesn’t always match the practice, Google tend to reward quality over quantity. But there’s a better reason to orient around quality. Given that publishing on the internet is so easy there will be a lot of noise. Everyone wants to find the signal amongst the noise. Producing mediocre content is easy. That is no barrier to entry. Producing quality content is more difficult, so many people won’t even attempt it. Quality is a means of standing out. It’s ephemeral, but most of us know it when we see it. Quality content is typically “better” when compared to what is available elsewhere. It has more depth, more insight, more relevance. Content must, above all, be relevant. To be sure we’re providing relevant content, we should test. We can look at engagement and performance metrics to see what content our audience likes the most and produce more of the same. We should produce less of the content they don’t engage with. In the end, quality, for our purposes, comes down to what the audience thinks is most relevant to them. It’s the content they engage with. Imagine if our wallpaper company produced high quality content, most of the time, but also produced some low quality content of dubious value. This could undermine the brand they have worked so hard to create. In this scenario, it would be better to cut or improve the poor quality content rather than risk the trust relationship they’re trying to establish. After having determined your audience and created the content – what next? If you’ve done everything right from an SEO point of view, your content should start to generate visitor traffic, views and engagement. Visitors will arrive via search engines, and any other site on which your content is hosted, such as YouTube. If you’re lucky, this activity continues to grow as people discover your content, tell friends about it, and link to it. More likely you’ll see some traffic, but growth, if any, will be somewhat slow. This is why we need to actively market content. We need to adopt PR strategies. PR – public relations – strategies are mostly about networking. It’s important to build, cultivate and grow a network of like-minded people as it’s much easier to spread your message far and wide if other people are prepared to do it for you. Given the popularity of tools such as Twitter and Facebook, building effective networks has never been easier. Be where your customers are: don’t expect them to come to you. You need to go where they are, and attract them to you. If your customers spend a lot of time on Facebook, you need to be on Facebook and engage with them there. Go where your competitors are: if your competitors are posting on YouTube, you should be there, too. Check out their followers on Twitter. Make their followers your followers. 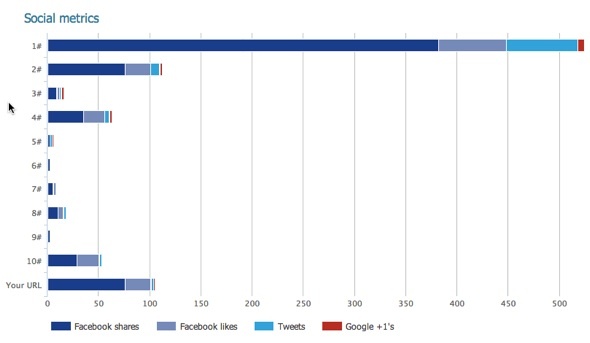 Make a note of their most popular content, and their least popular content. Learn from their successes, and mistakes. If You’re B2B, You need to be on Linked In: And even if you’re not, you still should be. LinkedIn is a professional network of contacts that is fast replacing the resume. It also includes, a place for the membership to ask and answer questions. Not only is this a great way to connect with movers and shakers, it’s a great way to see what problems people are having, and how they phrase and articulate those problems. 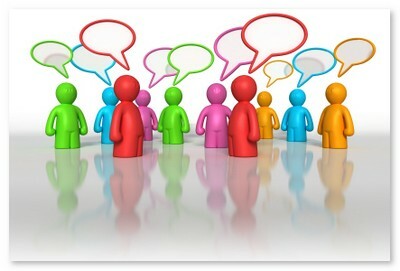 Forums & Blogs: Find the forums and blogs that relate to your niche. In the case of forums, sign up and participate. It’s a great idea to publish thoughtful, valuable pieces on forums as a lot of forum posts tend to be low value. It’s not that difficult to stand out from the crowd. Such posts are almost always appreciated, not least of which by forum owners who typically encourage people to provide quality information, which in turn boosts the value of their forum. You’re giving away content in order to get in front of an established audience. Likewise, adding thoughtful blog comments will get you on the radar of the blog owner, and readership, who may follow your links back to your site. Again, this is leveraging an existing audience in order to boost traffic to your own site. A common practice is to guest post on someone elses blog, which is an even better way to get in front of their audience. Before you make an approach, be sure to study their previous posts and editorial policy as blog owners are unlikely to want off-topic posting. They will like the fact you’re offering them free content, but only if that free content is unique and of sufficiently high quality. Forums and blogs are also great places to foster professional relationships. Typically, you’ll find like-minded and enthusiastic people, especially moderators and blog owners. Help them, and they’ll help you. Press Releases – this is traditional PR activity, but can be a bit hit and miss. Use services such as PRWire to distribute your press releases. Remember to include links back to your content. The value of press releases has been diminishing as social networks provide a somewhat richer, two way experience, but there is still a lot of traditional media who use press releases. Keep them relevant, targeted and interesting. Email marketing – Email marketing is still powerful because people regularly use email. People have learned to block out spam, so your messages must be targeted, and relevant. Preferably, you should be building your own list from your site as this becomes a valuable database from which you can remarket to existing customers. It’s tempting to publish, market, then forget. Certainly, when it comes to evergreen content, your content may stand the test of time. However, content can appear stale over time, which is why we should adopt a regular maintenance schedule or audit. Keep an eye on your top performing content and add to it and make it richer, where necessary, in order to keep it fresh. Nurture it. This doesn’t matter so much for less popular content, however non-performing content should be archived or moved down the hierarchy in order to re-focus attention on your your popular content. One way to ensure content is performing well is to assign goals to specific content. For example, “our news section should have 1,000 email subscribers six months from now”. The goal should be aligned with a business requirement i.e. “we know 3 in every 100 subscribers become repeat buyers, so we should devote resources to growing our email list”. We could also devise engagement metrics, such as bounce rates, to see if people are reading our content, as opposed to just clicking back. If we’re getting a lot of traffic to a piece of content, but people click back at a high rate, it means we’re likely got our topic right, and our marketing right, but we haven’t followed through on the delivery. Look for any pieces of content that meet this criteria and look to revise content, as necessary. These types of audits also ensure we stay consistent. Consistency is particularly important when it comes to brand. If people come to expect a certain level of quality from you, then the existence of low quality content may compromise your brand value and positioning. Either remove or improve such content. I hope that’s given you some ideas! Good luck with your content marketing. One of the many reasons why Ahrefs is my tool of choice is its ability to break down an anchor text profile quickly and efficiently. In this post, I’ll show you how quick it is to spot potential issues and how deep you can actually dig with this feature of an Ahrefs membership. When you look at phrases you are looking at the actual full anchor that resides on a given page. Whereas with terms you are seeing anchors that contain that particular 1, 2, 3, or 4 word term. If someone links to you with “auto insurance quote” as the full anchor, with no other words or characters in the anchor, then it will only show on the phrase report and not the 3 word term report. 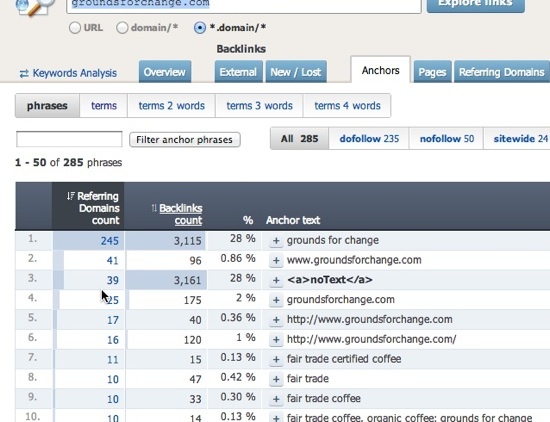 I like how they do that because if they put it in both the phrase and 3 word report it would make the data less useful as it would not portray an accurate reflection of the question “what percentage of my links contain this keyword specifically and only versus what percentage of my links contain these pieces in a given anchor”. 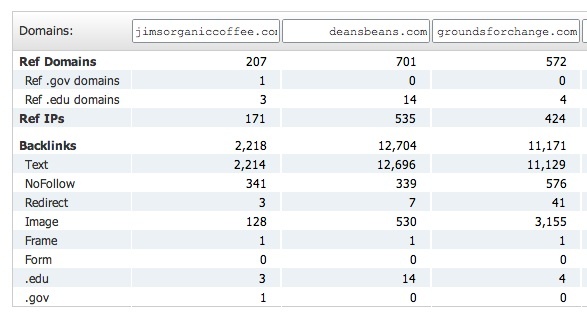 You can sort by any of the columns but here you an see that from a unique domain referral standpoint, the top 3 terms are essentially the company’s name and their most well-known product link with respect to singular terms that show up most often. What this report also shows is that even at a 2 term level many sites link to the domain with a brand component as well. 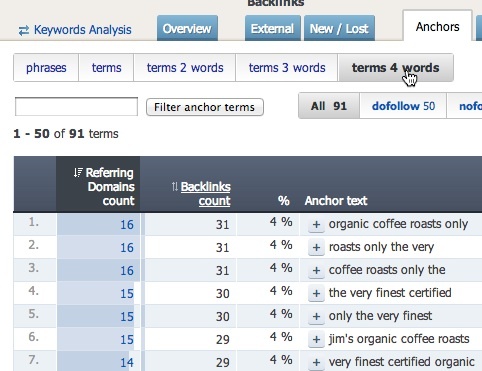 Most commercial keywords are of the 2 and 3 word variety. 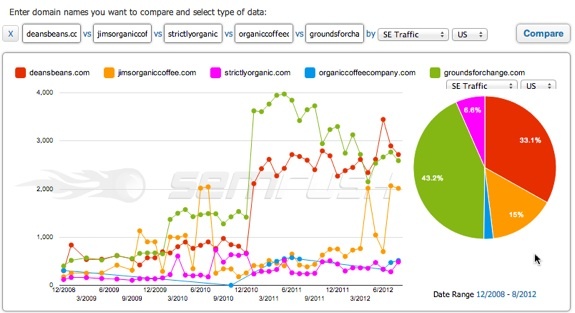 The single term report generally is a good test for the branded nature of the links. We saw in the single term report that the top 2 terms (in terms of unique domain count) were essentially part of the brand name. This 2 term report is continuing to reinforce the branded nature of the site’s anchor text profile. Here is where we can really start to see the most linked to commercial phrase(s). I do with Ahrefs would drop pipes and other characters from these reports and just focus on actual words but since Google generally looks at these characters as characters I suppose it’s somewhat ok to leave them in. Given that the top-level reports have established Travelers and Insurance as 2 of the core terms (and thus branded) it’s likely that the words attached to these terms are branded terms as well. This helps in establishing a natural link profile. Travelers has been able to establish the word Insurance as a part of their brand so when we see stuff like auto insurance quotes and such it is not all that unnatural to search engines because of the branded nature of this anchor text profile. We continue to see the emphasis on car and auto insurance related keywords with word separating pipes that likely included branded terms before and/or after. I would say that Travelers is well positioned for the auto/car insurance keyword group but they need to target the core terms better from an anchor text standpoint. From a marketing standpoint and a site standpoint Travelers tends to target a broader market of products then the other big insurers like Geico, Allstate, Progressive, and so on do. One module in a tool doesn’t tell a complete story nor does one tool. It is typically recommended that you use multiple tools to cross-compare different data points and metrics to come to proper conclusions or at least well-informed conclusions. There isn’t another tool out there right now that combines this terrific feature with the speed and depth of Ahrefs. The specific module alone is worth the cost of Ahrefs in my opinion, it’s important to have a deep understanding of an anchor text profile and Ahrefs is the head of the class at the moment. You can limited data with their free account or you can sign up to test it out in full, they do offer a 7 day money back guarantee. If you do decide to sign up please take advantage of their current 50% off the first month coupon (20% off annual as well). Conversion optimization is a process whereby you change the content and organization of a website in order to increase the percentage of visitors that convert into customers. This can be a lucrative process as it helps you extract more value from your existing traffic. If you’re wondering why more people don’t buy more of what you offer, or take the actions you expect them to, this article will give you a few ideas on how you can make changes to ensure they do. People are bombarded with messages. The advertising industry is everywhere – it’s on your television, it’s on the internet, it’s in the mailbox, and it’s on your phone. Each message must compete for consumer attention. It must do so in an environment where many consumers have learned to block messages out. Supply and choice is bountiful, but demand remains limited by the size of the population, and by the average pay packet. The consumer has a lot of choice. In such an environment, we must make every visitor count. If we convert more visitors to paying customers, or encourage more to engage with us, we stand to be more successful than our competitors. Conversion optimization is not just about e-commerce sites. It’s about all sites. When someone does something you want them to do, that’s a conversion. Conversion optimization isn’t just about changing a landing page. It’s about looking at your entire approach, every step of the way. It’s about refining your offer to ensure it matches what people want. We can make as many offers as we like, but we succeed when someone accepts our offer. Search engine optimization is mostly about the pre-offer and offer stages. We try and position a site against keyword search terms and achieve a high rank. If we do our job well, visitors will click on our link and arrive on our page. For many search engine optimizers, this is where their job ends. Unfortunately, if that is all we do, we are unlikely to create as much value as is possible. A significant part of the value chain depends on what the visitor does next. The visitor could click-back within a few seconds. They may not feel the page is relevant to them. They simply might not like the look of it. They may have been distracted or got confused. Conversion optimization is a process that aims to prevent these events from occurring quite so often. Search engine optimization brings in many potential buyers, but few actual buyers. Your mileage may vary, but a rule of thumb is that conversion rates across the internet are around 2-3%, meaning only two or three visitors per hundred will take our desired action. Where do we lose the 97%? Think of the web sales process as a funnel, with the widest end being the search engine results pages, and the narrow end being your shopping cart sales success page. 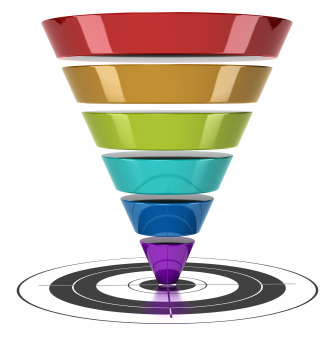 As the visitors move down through the funnel, they are getting closer to taking a desired action, but they are dwindling in number. They dwindle to the point where we’ve lost 97-98%, on average, by the time the 3% reach the narrow end – the checkout, or the desired action. Why do we lose so many? We lose people because we’re not meeting the customers needs. Conversion rate optimization helps determine what those needs are so that we can shape our offers and content to our potential customers. In so doing, we increase the percentage of visitors who convert to customers, and thus make more money with the same amount of traffic. Desired action is an activity we want the visitor to take. For example, if we run an ecommerce site, we want the visitor to buy a product. If we run a news site, we might want the visitor to click on an advertisement. If we run a non-profit site, we might want someone to sign up for a newsletter. Most sites have multiple desired actions. When we undertake conversion rate optimization, we try to figure out exactly what the visitor wants, and ensure they get it. We want to ensure their desired action aligns with ours. Optimizing our conversion rates can take the pressure off traffic acquisition spends. Search traffic is becoming harder to get, due to more competition and less predictable search algorithms. It’s becoming more expensive to get people to the start of the funnel, so it makes sense to try and widen the funnel so we convert more people once they arrive. Conversion Optimization is not as easy as simply tweaking a landing page. Like SEO, conversion optimization is an ongoing, iterative process that involves trying things out, measuring, and adjusting in order to produce a desired result. The difficulty comes in knowing what the customer really wants. An offline salesperson can tell a lot about a person just by looking at them. They can refine and reshape the offer constantly by asking questions and countering objections. This is harder to do online, but using conversion optimization, we can emulate this process. Consider your existing conversion rate. Figure out what you want visitors to do, and examine how many visitors are currently doing it. This is called the baseline. Once you establish a baseline, conduct an analysis. Look at your stats as visitors move through your site to see where you are losing them. Look at areas they are most interested in, and least interested in. Aim to get a snapshot of the current activity on a site. Armed with this data, we move to the optimization phase. We change a little at a time. We might change the offer, the copy, the graphics, and the site structure. In practice, we’ll likely change all four aspects. We experiment. Some changes will work. Some won’t. Some will be negative and send us backwards! The important thing to understand is that it is a process, and that process is iterative. Always be testing, as even subtle changes can produce significant results. Google experimented with 41 shades of blue before they found the color that users responded to best. One myth concerning conversion optimization is that all you have to do is test one page against another and repeat until you find the winning page design. Perfect! Now, watch the money roll in! In reality, this seldom works. It doesn’t work because there are many factors that go into a conversion. The conversion process is a series of steps. If any one of those steps falters, then we can lose customers, regardless of how well the design of a given page has been tested. In order to find out the problems and opportunities inherent in each step, we must use a systematic, repeatable process. Conversion doesn’t just happen at the end. People don’t just click “buy now” and hand over their credit card details. As we’re seen, only 3% of our visitors, on average, will get that far. What about the other 97%? We’re losing the other 97% at various steps in the process. Each step is an opportunity to optimize conversion. It’s useful to map out every possible goal and step if only to test whether you should eliminate some! I’m sure you’ve spotted one problem straight away. Why does the buyer have to create an account before they can make an order? Our hunch might be that buyers don’t like creating an account at this point. In order to prove our hunch, we should watch abandonment rates at this point in the process. If we see high abandonment rates, we might create an option that allows the user to place an order without setting up an account. We then see if this change results in higher conversions. The buyer might like a painless ordering system that lets them buy, then asks them where they want the item delivered. It’s a subtle distinction. We glean the same information, and can use this information to set-up an account, but we haven’t inhibited the purchase. We should then think about what fields are really necessary. We may require all those fields, but we should also ask ourselves if they are strictly necessary. If so, are they strictly necessary at this exact point, or can they be derived later? Each option a user takes will have a different business value. If our aim is to collect email addresses in order to build a mailing list, then we might give the email field a high value relative to other options, such as a search field. We might repeat the request for the email address on various pages, or feature the form prominently, whilst making other options less frequent or prominent. Some optimizers feel that we should only give the visitor one goal. For example, the goal of landing page X is to result in a sale. Whilst this makes it clear for the business, it may not work well for the visitor. If the visitor wants to research information before making a decision, we lose them if we don’t provide the visitor a path to find this information. It’s similar to the way businesses use KPIs to help track their performance. KPI stands for Key Performance Indicator. KPIs help you define and measure your progress towards your goals. You may have a goal to “make more money”. Let’s refine that a little and make it more explicit. “The goal is to boost revenue by $500K this year”. We then work backwards from this goal and work out the steps needed to achieve it. Each step must be measurable and quantifiable. Each option leading to a goal can be stated in micro terms i.e. “we want 10% of people to click on the shopping cart button”, as we’ve determined that the more people who click on the shopping cart, the more likely they are to progress to the next step, which is to fill out their credit card details. Goals will, naturally, differ depending on the type of site. In e-commerce,indicators of success or failure may include the number of conversions, order values, and checkout process abandonment rate. They could also include the number of purchases people complete off-line i.e come into your store as a result of researching on your website. Once defined, we know what we have to change to achieve our goals. We also have a means to measure the effect of the changes. If we know the value of an order, we have a clearer idea of how much to pay for our advertising. Is $0.50 cents too much for a click? $2.00? $8.00? How much should we spend trying to optimize for position #1? How much is position #1 worth? Let’s say a unit we sell has a margin of $100. If we get 1,000 visitors, and convert at 3%, that means we sell 30 units, which means we make $3000. If we spend $3000 in advertising, we break even. We could spend up to 0.33 cents for those clicks. Anything below this figure, we make money. This is a very simplistic way of looking at it, of course, as we have other costs, such as the total campaign cost including design and optimization, and the lifetime value of the customer, but it’s a way to illustrate how we can set and manipulate budgets once we know the conversion rates. It’s also a way to show how profitable conversion rate optimization can be if we increase the rate. If we doubled the conversion rate, we’d see significant improvement in the bottom line. Using the same example, a unit has a margin of $100. If we get 1,000 visitors, and convert at 6%, that means we sell 60 units, which means we make $6000. If we spend $6000 in advertising, we break even. We could spend up to 0.66 cents for those clicks. Anything below this figure, we make money. The “bouncers” are the people who land on your page, but click back. Exit rates are determined by the number of people who get someway through the conversion process, yet abandon it at some point. These are the 97%ers. These are the people we want to try and convince to stay. Bounce rates have a lot to do with relevance. If people click back immediately, it’s because they don’t feel the page is relevant to them. They may have clicked on a PPC ad that led them to believe one thing, but when they arrived, they were shown something else. Or, perhaps, those two messages were in sync, but the page itself didn’t appeal to them, or wasn’t clear. We can do a lot experimentation around bounce rates. We could change the PPC text. We could change the design of the landing page. We could change the copy of the landing page. Exit rates give us a good idea where to start optimizing. If people get to step X of the shopping cart process, but abandon the process in high numbers at that point, we can safely assume there is something wrong at that point. We could change this to make it easier, more transparent, we could address security concerns, or perhaps place a chat application at this point, prompting people if they appear to need help. The concept at the heart of conversion optimization is that the customer is King. The design, the copy, the process must all be aligned with your customers. Failure to do so will result in click-backs and loss of revenue. But how do we know what the customer wants? We could guess. Web designers tend to design what they think looks good, which is fine, but measurement drives conversion rate optimization. We’re not interested in what designers *think* might work. We need to prove what actually works. Who Is Using Our Site? What Do They Want? One means used by marketers to get a better idea of what their users want is by using “personas”. Personas are archetypes of customers. It’s a way to put yourself in someone elses shoes and imagine seeing the world through their eyes. This is important, because our customers aren’t all the same. They will likely be buying for very different reasons. Imagine you run a car yard. A 20-something female walks onto the lot. She wants to buy a reasonably priced late model car. Something not too expensive, but something that looks great. She’s not overly interested in specifications or performance, but it can’t be a slug. Fast is good! Minutes later, a middle aged man walks onto the lot looking for a vehicle he can use for his construction business. He’s pretty sure he wants a pickup. Or maybe an SUV. He doesn’t care about price. He also wants something he can take offroad in the weekend. Two very different customers who both want something you have. You need to talk to these customers differently. This is easy to do offline, where you can size them up, watch their expressions, ask questions, listen to their responses, and interact. This is harder online where you tend to track what they do by observing data. If we create personas for these different people, it can make it easier to determine how the site should look, and where we should place certain features and messages. To create a persona we detail a personas specific characteristics. The young woman becomes Zoe, a 25 year old advertising executive. She is interested in fashion and travel. She doesn’t have much disposable income, but has got a good line of credit. She is concerned about price, but she is most concerned about appearance. Similarly, Warren is a 55 year old builder, married, with two kids. He’s well off. He’s not spendthrift. He likes things to be solidly built and dependable. What Personas Should We Choose? We need to try and understand our customers. We can do this using surveys. We can monitor feedback. We can study the language used in the emails they send us. We can buy market research data, such as demographic information. We can tap into our experience of previous customers. The field of psychology helps us build credible personas. You may be familiar with Jungian archetypes and Myers-Briggs Type Indicators. These provide an intellectual basis for categorizing people into groups of people who will behave differently in the same situations, based on the way they experience and respond to the world. In terms of conversion optimization, we should be aware that there are impulsive types, cautious types, and logical types. They will likely respond to different triggers. For example, we don’t want a shopping cart to get in the way of an impulsive person (see Amazon’s solution in the form of 1-Click ordering and in-app purchases by games manufacturers). On the other hand, we need to provide enough reassurance for the cautious person. Examples include security information, a returns policy, and brand awareness. Logical types will require sufficient information in order for them to make a considered judgement. There are many cross-overs, of course. A person may be logical in one context, yet impulsive in another. The important thing is to test your website with each personality type in mind and see if it creates problems for each type. As we build up a knowledge base of our customers, we can constantly refine our offer and positioning. Let’s revisit our car yard example. Why is this car buyer coming onto a lot? Why did they choose this lot, and not another? What do they expect to see? A lot of cars? Few cars? Cars displayed inside? Outside? More of one type of car than another? What are the questions this persona is likely to ask? What are their likely objections? What would make this persona go away? I’m sure you can think of many questions once you have a specific persona in mind. You can then switch persona, and look for areas where the questions, and responses, will be similar, and where they change. In terms of a web site, each persona may raise questions about shipping. Is free shipping important to this persona? To all personas? If you determine it is, then you might want to make a prominent feature of free shipping. Another issue that may come up is trust. You might find it’s not as important as the persona browses and gathers information, but becomes a big issue at checkout. Your trust messages could be hinted at through your site, but highlighted at checkout time. Design a range of personas, then step through your website. Look for areas that seem to fit well with one persona, but grate with another. These areas need work. We can change the layout of these areas. Change the graphics. Change the copy. Experiment to see if we can find areas that don’t grate against different personas. We can test in a live environment to see what visitors actually do. If we notice an uptick in one customer type, or a downturn in another, we can tweak and adjust accordingly. We need to think about ways to gather demographic information to better inform our process. Personas aren’t a magic bullet. Will Warren and Zoe really shop differently online? Or will they both respond equally well to an easy-to-use website? Are these personas really rooted in reality i.e. hard data, or are they imagined? I think personas are a useful means of approaching site design and site structure in that they force us to look at things differently. They force us to test assumptions. Testing assumptions lays at the heart of conversion optimization. No matter how good your usability, your personas, or how easy your shopping cart is to use, your site won’t succeed unless you have a clearly articulated value proposition. A value proposition is a promise of value to be delivered. The customer must believe they will derive this value. A value proposition can be weak or strong. A weak value proposition might be when the customer can easily find the same value, elsewhere. A strong value proposition might be when the customer can’t get what you offer anywhere else. You may offer lower prices. You may offer something that improves their lives markedly. Whatever your value proposition is, ensure it is clearly articulated. Keep in mind that your value proposition will be relative. Customers will compare your value proposition with other sites. So, part of your task in optimization is to compare your offering against those of your competitors. Look for opportunities where your competitors may be catering for one type of customer, but ignoring another i.e. they’re talking to the Zoes, but ignoring the Warrens. This presents a market opportunity. Value propositions are linked to the motivations of your customers. Some customers will be motivated to solve a problem i.e. they have something in mind they wish to buy. Other customers will be motivated by the need to gain information. The value proposition you offer may be different for each type of visitor. Your site needs to articulate your value proposition to as many different types of customer as possible. The visitor must deem your site to be relevant. SEOs know the value of relevance i.e. the keyword term must match the landing page. In conversion optimization, we extend this idea all the way through the site. There should be a consistency from search result to shopping cart. If you advertise the cheapest prices, then you must display them, and the final shopping cart price must demonstrate it. Fail to do so, and you’ll lose the visitor who clicked through on a promise of low prices. A visitor may look for signs of social proof. The danger in buying is that it presents a risk. There is the risk the retailer won’t deliver as promised. There is social risk that the buyer will feel let down by their purchase. Their friends might not think this is a good idea. They seek validation. This is why providing social proof is a powerful tool that aids conversion. Who else has purchased this? Are they my peers? Strength in numbers may be a somewhat irrational validation, but it’s still a powerful conversion technique. Other methods of establishing credibility include membership of recognized trade organizations, reputation in the market, and increasing brand awareness. Entire books could – and have been – written about design. In terms of conversion optimization, there is only one way to know if your design helps, or hinders, your visitors. Test. Make a change. Retest. I suspect you already know that making the design easier to use will pay dividends. The tricky part is working out exactly where a design can be made easier, especially if the site is already easy to use and free of obvious problems. This is why it’s important to watch how other people use your site, especially those who aren’t already familiar with it. There are various services available that will present your design, and ask users what they think your site is about. There are various services that track user eyeball paths. And your analytics, of course. If you spot areas that cause problems, make incremental changes, then retest. It’s best to make minor changes, as then you can isolate the problem without risking introducing others. You may have heard of split/run testing, also known as A/B testing. Split/run testing is when you test different designs, side by side, and see which design works best. For example, you may create a landing page where you want someone to sign up for an email list. Do we put the request for sign up at the bottom, after we’ve explained everything? Or should it be the first thing people see? Should it be red? How about blue? So we test the different layouts against each other and see which one works the best. We can change every variable, including copy, headings, images, placement, and the number of times we restate the offer. Rather than rely on our hunches, we test. Similar to A/B testing is multivariate testing. This testing allows you to test more than one component at once. Some websites benefit from constant and continuous optimization as visitor response to creatives and layouts differ by time of day/week ,or even season. A/B is obviously the simpler of the two. It’s probably a good idea to start with A/B testing, and then introduce multivariate testing when you’re trying to squeeze every last bit of incremental performance out of your pages. As you can see, conversion optimization is not just about tweaking landing pages or finding the right copy. It starts with a detailed business analysis of strengths and weaknesses and flows all the way through your approach and site. Have you noticed a rise in content being pushed to and created on sub-domains of authoritative websites? A strategy born out of Google’s Panda update (and subsequent iterations) has been to move specific content to its own sub-domain as a way of getting around being algorithmically viewed as a content farm. There are a few reasons for this and it is most effective when the sub-domain hangs off of an existing domain which has a fair amount of existing authority and trust. Google initially treats sub-domains as somewhat separate sites, compared to the root domain, and over time most of the authority gained by the sub-domain can be passed back to the root, or pages on the root, via internal linking and vice versa. Another point of interest with this approach is that penalties generally do not flow down to the root domain from the sub-domain so one can be a bit more aggressive on the marketing of the sub-domain and not worry so much about perceived lower quality stuff on the sub-domain taking down the entire root domain. 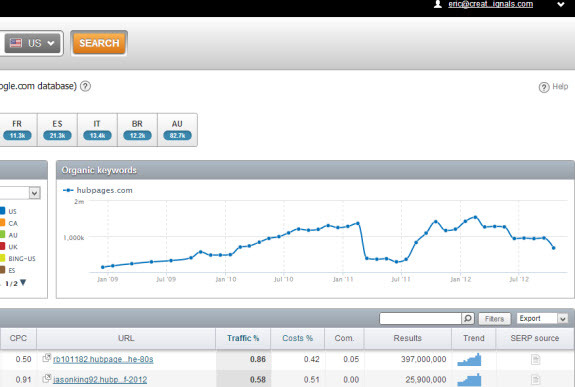 SemRush has consistently produced the best results for me, over time, with organic SEO data. Their interface is incredibly slick and has undergone frequent updates as the product has matured. Their updates are solid as well and they don’t try to give you all sorts of useless custom metrics that cloud the interpretation of the relatively clean data they provide. 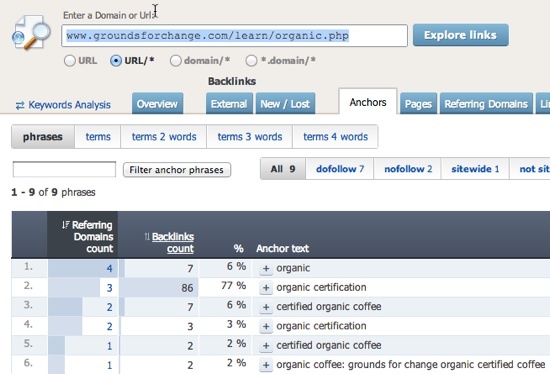 SemRush groups an entire domain (subs and the root) when you search the core domain. At present, it is not possible to just search the sub-domain and the sub-domain data is only available to paying subscribers. They have generous export limits and multiple pricing tiers so you can get all the keywords (sub-domain and root domain) you need on a site. Rarely have I run across a research project where I couldn’t get all the data I needed. They have plans that allow for the exporting of anywhere between 10,000 and 100,000 keywords as well as giving you 3,000 to 10,000 requests per day (tons of data). If you have a really large project outside of the above-mentioned limits, you can request a custom data report from them as well. Some of the best targets will be found by simply following trusted news sources to uncover these kinds of strategies. In the linked to article you’ll see a self-professed Panda recovery from Hubpages via the “moving content to sub-domain” route. Some other ways to check on prospects for research would be to cobble together various Panda “Winners and Loser” lists. You do not necessarily need to target just winners either. Remember, the goal is to uncover keywords for your campaign(s). Researching a site that made these kinds of changes and benefited would be a benefit for me, not a necessity. Plus, some of these lists might be taking into account the success of the root domain itself, not necessarily new sub-domains in addition to the pure root domain. In addition to all that, you can gather both keyword and content ideas from either winning or losing sites (in those lists). The keywords and content are likely still worthy to pursue but the execution might have been poor on a losing site or that losing site might have got hit by another, somewhat unrelated algorithmic update (Penguin, for example). SemRush also incorporates Bing (as you’ll see in the image below) so you can utilize that data as well but for the purposes of this post we’ll be focusing on Google in the US (note they also have many countries available too). Hubpages covers a ton of topics so you might be just interested in a few. Here, I’ve included keywords that contain the word 90, have a volume of greater than 500 searches per month in Google, excluded 80 in case any of those snuck in, and asked that only keywords where Hubpages ranks less than 5 are shown (I want to see their most important keywords). Now we are left with only 43 keywords out of 670k+ and the beauty is that when we export we are given the filtered data. You might have guessed this already but now we can dive right into sub-domain research. We can clear out all these filters and show only the sub-domain of this specific author. You might already know the sub-domain you want to research, if so you can considerably cut down your research time using these powerful filters. If I wanted to dive more into this specific sub-domain all I would have to do is copy the sub-domain and add it as a filter (now I have 30k+ results off of this sub-domain only). This is why SemRush is my tool of choice for sub-domain research. You can take any sized site and quickly whittle down to the specific product, author, topic, etc that you need or want to research. 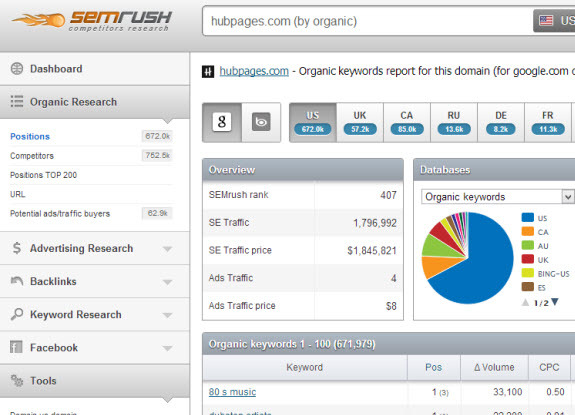 Give SemRush a try today, it really is one of the best tools on the market. If you want to do well at SEO, then crafting pages to please readers is important. In this guide, I’ll show you how to write great copy that hooks in visitors. If visitors land on your page, but click back, you’ll do less well at search. Recent changes in search algorithms mean your pages are likely being judged on how useful a user finds your page. One way to hook readers into your site is by using well-crafted copywriting. If you convince more of your visitors to engage in a “desired action”, which is the end-goal of copywriting, then the more profitable your site should become. As internet traffic gets more expensive, the sites using copy that converts more visitors than the competition will likely win the game. These sites will be more able to afford to invest in traffic generation. If a searcher is looking for a good offer on a product, they might click the result at #1. If they don’t find an offer to their liking, what do they do? They’ll likely click back. They’ll try another site further down the page. They may click on three of four results before they find the offer they want. They may rephrase the search query. There is no point ranking well if the customer doesn’t like the offer, or the offer is not clearly articulated. There is SEO value in presenting a great offer. There is also SEO value in making that offer clear to the reader. The value comes from making the most of each visitor. The higher your conversion rates, the more distance you put between you and your competitors. Copywriting is language used to encourage the reader to take action. Copywriting differs from “telling” and other academic forms of writing in that the goal isn’t simply to convey information, but to direct the reader towards a transaction. You may have heard the phrase “SEO copywriting”. What some people mean by “SEO Copywriting” is “stuffing the copy with keywords”. For example, if I were targeting the term “seo copywriting”, I might be tempted to include the term “seo copywriting” often, meaning the page may be more likely to rank for the term “seo copywriting”. Repeating keywords can make the copy sound ridiculous. Ridiculous copy is unlikely to move visitors to desired action. This keyword-stuffing approach came from a time when search engines placed a lot of emphasis on “keyword density” i.e. the number of times a phrase appeared in the copy relative to other terms. Search engines no longer place ranking weight on this metric. 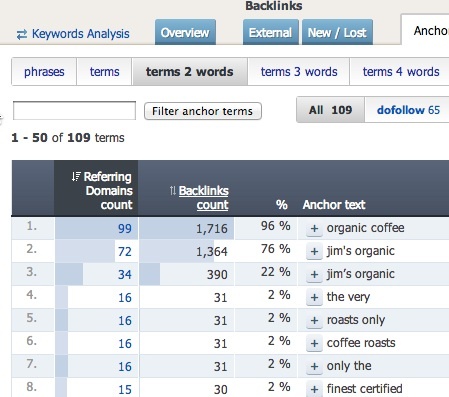 I’ll show you better way to integrate keywords. Copywriting describes benefits. For example, “the internet you can put in your pocket” is a benefit statement. It could be used to convince someone to buy an an iPhone. Copywriting presents an offer. For example, “buy now and receive two months of free data”. An offer may also take the form of a desired action i.e. “sign up for our email list”. There are two aspects to SEO. External and internal. External aspects concern factors beyond your site. A search engine will rank your site by looking at links pointing to your site from other pages. The second aspect is pages on your site. You have a lot more control over these pages. If you have interesting, well written content, then it is more likely people will be happy to link to you. Once visitors arrive on your site, it is more likely they will engage with your message. If your pages are on topic, and interest a reader enough so they don’t immediately click back, then your rankings are likely to increase. Both external and internal factors must work together in order to get the most out of SEO. It’s not just about getting visitors to your site via search engines, it’s also about what visitors do when they get there. Poor writing, or writing that doesn’t hook people in, can lose hard-won visitors. The most important aspect of copywriting is the headline. It’s the hook that draws people in. If we don’t have a great hook, people are unlikely to read further. In terms of SEO, the headline plays an even more important function. When a user clicks-thru on link text from a search result, they expect to see a similar headline on the page they land on. This serves as confirmation they have found a relevant result. The title tag is a good place to use keywords terms. These will be displayed in the search result. If a reader clicks on your link, they’ve already committed to read further, so long as the headline on your landing page reaffirms their interest. Readers aren’t interested in you. Or your product. Readers are interested in themselves. Therefore, effective copy makes an appeal to self interest. A benefit is what the product or service does for the user. For example, an iPhone “holds the internet in your pocket”. Benefits are typically stated as verbs. Benefits are active. For example, “the iPhone’s slim shape makes it easy to fit in your pocket”. You may notice I’ve rolled a feature – the slim shape – into a benefit i.e. “easy to fit in your pocket”. This is a powerful technique that intertwines the features and benefits, and thus makes them more memorable. Benefits should not be confused with features. A feature describes an aspect of the product or service. For example, a 24 hour battery life. A benefit is something the feature enables the user to do. In the case of a 24 hour phone battery, the benefit is “you can go all day without plugging the phone into a charger”. People care very little about your product or service. They care a lot about the benefits your product and service can offer them. Try making a list of benefits to integrate into your copy. An easy way to do this is to make a list of features, then write next to them what each feature does for the reader. When you come to write your copy, identify the benefit you most want your reader to remember, and work this into your headline. Readers are certainly likely to want to read further as the unexplained benefit headline is an enticement to discover more. Also note that in the last example, I added two benefits to make the headline even more compelling. In terms of SEO, it can be a good idea to work a keyword into a headline if you can do so without compromising the headline. It’s better to have a compelling headline than force an inappropriate keyword where it should not go. Keywords can be integrated elsewhere, if necessary i.e. in the body text and/or in the title tag. You only get one chance to make an impact, and a click back is likely to cost your rankings, and business. You can look at benefits in a number of ways. Opportunities to “reduce pain” are a benefit. For example, “Clean a window in ten seconds using MicroClean technology”.The “pain” is that windows can take a long time to clean. I’ve also added a proof i.e. “MicoClean Technology”. The reader may not know what “MicroClean Technology” is, but it creates a lead in for me to explain it in the body copy. If nothing else, the readers curiosity is aroused. We’re all familiar with offers. “Buy one, get two free!” “Buy now, and pay nothing for the first 12 months”. “Fill out your email address and go in the draw to win a holiday”. An offer makes for a simple, compelling headline. Offers as headlines work best when the reader is already familiar with your product. Offer headlines work less well when your product and service needs explaining. Clearly, these headlines imply a change to the status quo. You cannot currently cannot drive all day without getting tired – well, most of us can’t – and you can’t book flights in your sleep. I’m setting up an expectation that I’ll provide information about a new way to do those things. If someone reads further, they will find out what it is. The headline has one purpose. To get people to read down into the body copy. The body copy has one purpose. To get people reading to the close. Each line has a purpose. To get people to read the next line. The promise setup in the headline must be satisfied in the body copy. Once you’ve crafted a great headline, the first line of the body copy should come easily, as all you have to do is explain the headlines. If we led with an offer, we explain the offer. If we used “Go in the draw to win a holiday”, then the first line would explain the offer. “All you need do is give us your email address, and you’ll go in the draw to win an all-expenses paid trip to the destination of your choice”. If we led with news, we demonstrate the impact of the news on the reader. We demonstrate how the news will change their lives. If we used the headline “Latest in-home power generation unit means no more monthly power bills”, the first line of our body copy might be “Latest developments in home power generation units mean you need no longer pay line charges for grid electricity. Simply install a HomePower unit and it will provide all your electricity needs for up to a year. Your local dealer will then swap the replaceable power unit with another fully charged unit, and you’re good to go for another 12 months”. The body copy has a beginning, middle and end. Obvious, of course. But why does this three-step format work so well? It’s the format of stories. Stories are a very powerful means of communication. A film will start with a depiction of the status quo, usually a problem the protagonists must overcome. We see the protagonist overcome the problem, and then reach a new status quo. Viewers like to see movement from stasis to a period of chaos, to a new stasis. Order. Disorder. Order. This structure can also be applied to copywriting. At the beginning of a movie, the main character will face some form of trouble in the first twenty minutes. In copywriting, that “trouble” is the problem to be solved. “Your body aches”. “You get tired”. These are the challenges our central character must face. You can identify “the pain” by examining your product or service and look at the problem it is solves. An SEO agency is trying to solve the problem of lack of visitor traffic from search engines. A car manufacturer is trying to solve a transport problem. A movie maker is trying to solve a boredom problem. “The middle” is where you counter the problem. To use our example “when you drive long distances, your body aches. You get tired. But there’s now a great way to avoid those aches and strains, with contour car seat covers that gently massage your pressure points”. The middle is “But there’s now a great way to avoid those aches and strains, with contour car seat covers that gently massage your pressure points”. The solution to the pain of body aches is the “contour massage seat covers”. The contour solves the pain – in this case, quite literally. This is also the point you can build credibility. People today tend to cynical, especially of exaggerated advertising claims. The headline and opening lines make some big claims – which sound great – but the reader now wants proof. If the middle fails to provide proof, you’ll lose them. When providing proof, switch to factual mode. Describe features, make comparisons, expand on the characteristics of the product, talk about quality aspects, provide credible research data and endorsements from other customers. The end of the story is when you bring the reader into the narrative. Up until this point, they’ve been interested, passive observers. Tell them what action they should take should they identify with the story. This action will save them from pain, or provide them the benefits – or pleasure – that have been outlined. They should ring this number now, make an order, sign up for an email, or whatever it is you want them to do. This is called…. Now is also a good time to restate the offer. In long copy, you may need to restate the offer a number of times, but regardless of copy length, you should always do so in the close. You then need to tell the reader how they can accept the offer. This could be and address, a form, a telephone number. It should be crystal clear at this point what the user has to do – make it explicit. If the reader has read this far, they are definitely interested – so don’t be shy about coming right out and saying what you want them to do. This is also the point you may have to overcome final objections. This is tricky to get right, as you need to anticipate what the objections are likely to be. In commerce, especially online commerce, people are concerned about security of their credit card numbers. Ensure you address this concern by displaying security badges and other safety identifiers. People are concerned they are buying based on description, rather than seeing the actual product. If you can, try and offer free trial periods and money back guarantees to reduce the buyers risk. These offers can work well, because the number of people who claim their money back tends to be small, yet those who are put off if you do not offer such guarantees can be significant. Buyers may also resist doing anything, because it’s easier to do nothing that to take the risk and do something. This is where time limited offers work well. If they don’t act now, they risk missing out. The fear of missing out is a strong driver to act. There are various other tools you can use throughout your copy to give the final shine and polish. Smaller headlines are particularly useful for breaking up long text. This is especially important online, because readers tend to scan. Graphically emphasize important points using larger type, or different fonts and colours. Again, this can help connect with readers who scan. Not everyone is the same, so will react to different points you make. By using subheadings, you can can draw attention to multiple points that may otherwise get lost within the text. You can use images, different fonts, boxes to attract attention to individual points within the copy. Callouts help break up the monotony of a page full of text and draw attention to specific features. Make a list of features and benefits. Decide on the most important benefit. Make this your headline. 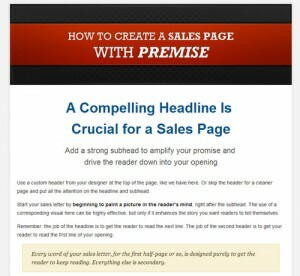 To craft a headline, take a verb and add a desirable quality. The first line should explain the promise setup by the headline. In the body, highlight the problem, and show how it can be overcome. Describe features and benefits. End with an offer. Tell the reader what they need to do next. 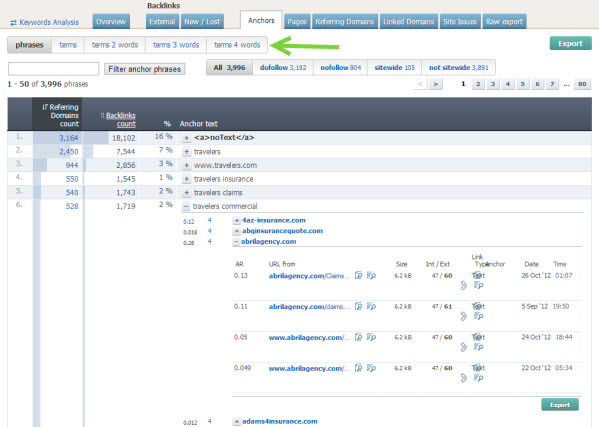 A unique feature of Keyword Spy is the ability to research affiliate and affiliate network ads. As part of their Professional membership package they offer you the ability to get in-depth data about top affiliates, affiliate products, and affiliate networks. specific product and super-affiliate data from Clickbank, Commission Junction, Link Share, PayDotCom, Clix Galore, ShareASale, MAXBounty, TradeDoubler. You can do affiliate ad research on any domain you’d like, simply enter the URL then click on ads then sort by affiliate only. 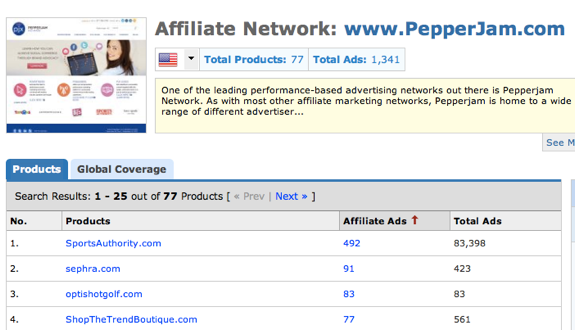 I like to use the Affiliate features on Keyword Spy to evaluate and see what products exist on certain networks. 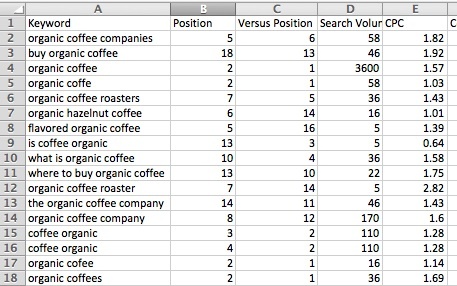 What I generally like to do, for organic SEO, is to export the affiliate ads data (specifically the keywords)and check the search volume to determine what keywords I might want to add or consider for an organic SEO campaign. I would check the rankings of those keywords with a robust rank checking tool like Advanced Web Ranking and have the tool grab the top 10 competing results as well. I’d use a domain that wasn’t ranking so I could get the top ten sites ranking for each keyword and begin to evaluate the competitiveness from there. Another thing I like to use this part of the Keyword Spy tool for is to come up with ideas for my own affiliate products (specifically information products) which I could create and market to some of the super-affiliates and/or affiliate networks that might be a good fit based on data given to me by this part of the Keyword Spy membership. 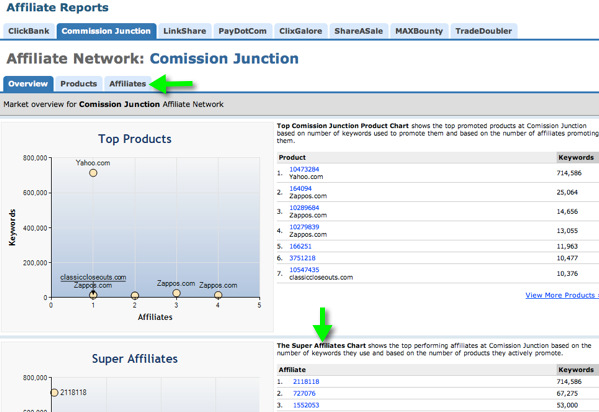 The affiliate detail screen will show you all the keywords and products (by product ID) the affiliate is advertising on in addition to the position of the paid ad and the competitors for the keyword being bid on. 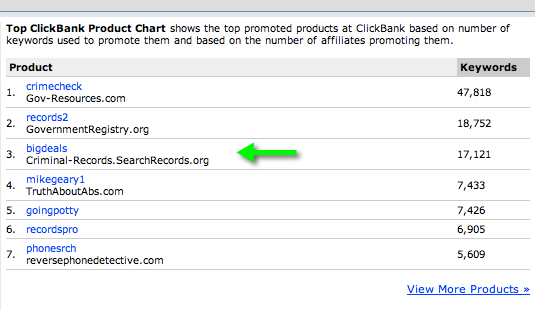 You can tab between keywords, products, and ad variations which are being used by the selected affiliate. Another thing you can do, if the affiliate network you are researching doesn’t have the affiliate ID feature, is to find affiliate ads by doing a keyword search and then using the affiliate link as a destination URL search. You have to have the Professional membership in order to use this tool. 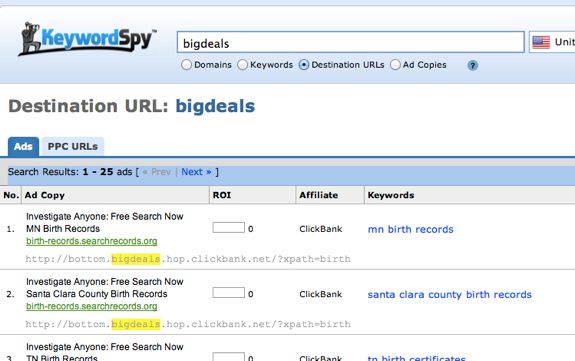 Keyword Spy offers 3 membership options, Research, Tracking, and Professional. Once you activate your Professional membership you’ll get access to over 60 networks and millions of ads to research as well as competitive research data on thousands of products. Keyword Spy is the only major competitive research tool that offers in-depth Affiliate Research. Also, you will get instant access to the ads and products super-affiliates at 8 major affiliate networks are promoting along with statistics to determine what is and isn’t profitable for them. 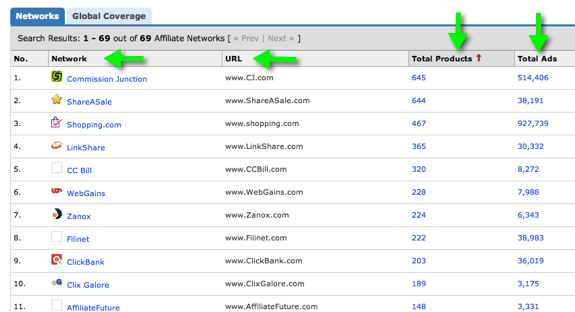 Give Keyword Spy’s unique Affiliate Research tool a try today, you can sign up right here. Want to try SEM Rush? click here for a free 14 day trial.